LAST BUYERS FELL THROUGH. GREAT HOME INSPECTION THOUGH AND FHA APPRAISAL AVAILABLE. BIG AND BEAUTIFUL! PRISTINE 5 BEDROOM 3 BATH W LOTS OF BELLS AND WHISTLES. THIS HOME HAS BEEN CARED FOR WELL AND IT SHOWS. IT IS ON A CORNER LOT ON CITY WATER AND SEWER AND IS WATERFRONT!! IT HAS NEWER PAINT - EXT AND INT, UPGRADED HOT WATER HEATER TO 80 GALLON, KEYPAD ENTRY ON GARAGE, NEWER CARPETS IN ALL BEDROOMS-HALL, STAIRS. SHOWER IN MASTER IS SEAMLESS GLASS AND BATHROOM HAS WOOD PLANK FLOORS AND SOAKING TUB. THE BATHROOM DOWNSTAIRS IS HANDICAP ACCESS WITH NEW ROLL IN SHOWER AND GRAB BARS. THE DEN HAS BEEN COVERTED TO 5TH BDM W WALK IN CLOSET. KITCHEN HAS RESTAURANT QUALITY APPLIANCES WITH CONVECTION OVEN AND MICROWAVE. THERE IS CROWN MOLDING THROUGHOUT, CLOSET ORGANIZERS IN BEDROOM CLOSETS AND KITCHEN HAS THE ROLL OUT DRAWERS. LOTS OF SECURITY FEATURES IN THIS HOUSE AND NEW IRRIGATION SYSTEM JUST PUT IN PLACE. CLOSED IN LANAI IN BACK AS YOU ENJOY YOUR COFFEE WHILE OVERLOOKING THE WATER. THERE IS A 5500 WATT GENERATOR THAT WILL GO W THE HOUSE AND NEWER REFRIG IN THE GARAGE. 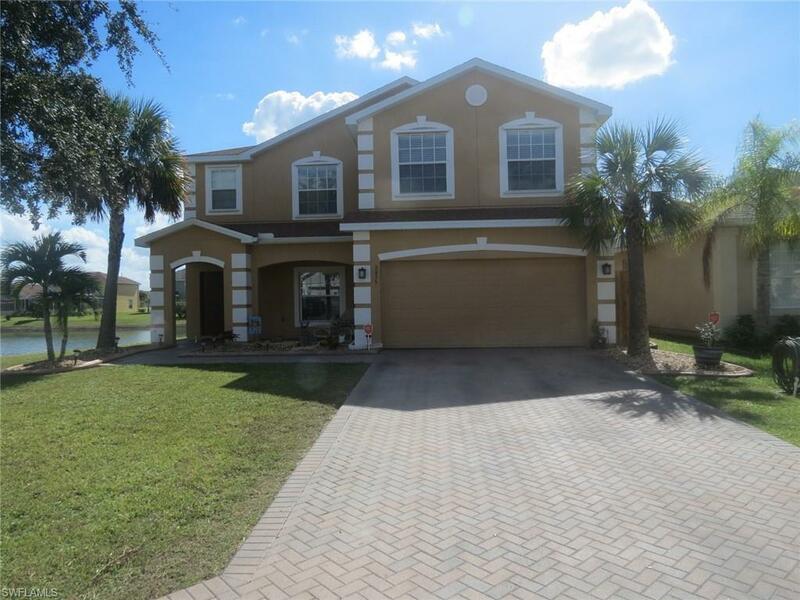 NEIGHBORHOOD IS CLOSE TO FT MYERS AND SHOPPING IS IN WALKING DISTANCE. THIS HOUSE IS THE COMPLETE PACKAGE.